The Columbia River Gorge is famous for it’s wind and it has been living up to that reputation lately. Great for kiteboarders and sailboarders, but bad news for kayak fishing. The Columbia River is also running petty high and the currents are strong in spots. High winds and strong currents mean very dangerous kayaking conditions, which is too bad because this is one of the best times of the year for smallmouth bass fishing. With no signs of relief from the Gorge wind, we headed east to the John Day River. The wind forecast was right on the border of being too windy, but we decided to take a chance and make the fifty mile drive to the John Day. As we left Hood River, OR, the wind was blowing at least 10 mph with stronger gusts and small whitecaps on the Columbia River. As we crossed the Deschutes River, the wind had subsided considerably, giving us hope that the wind further to the east would turn out to be less than predicted. 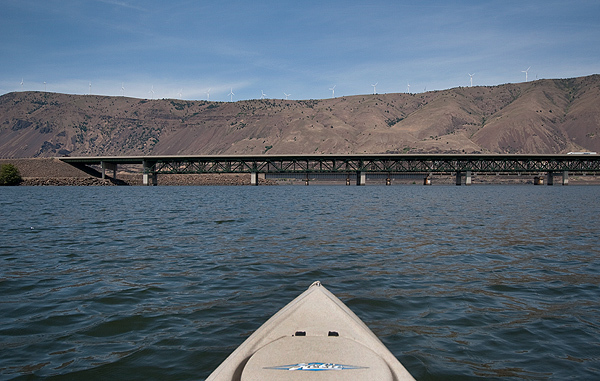 When we arrived at the John Day River, we were surprised and relieved to find the wind nearly dead calm; the wind turbines on the hilltops above the Columbia River were not moving and the river was calm and glassy. We launched at LePage Park and paddled out into the calm John Day River and headed for the Columbia River, planning to fish where the John Day empties into the Columbia until the wind picked up, then head up the John Day where it is a little more sheltered from the usual west to northwest wind. Fishing off the riprap between the I-84 and railroad bridges at the John Day rivermouth, we started to catch one smallmouth bass after another; nearly a fish on every cast. Most of the bass were on the smaller side, but even short smallmouth bass put up a pretty good fight. After an hour or so of nonstop hookups, we headed across to the east side of the river looking for the bigger fish. Pretty much the same story there; a lot of smaller fish with one pounders hitting the lures every so often. It was a hot, sunny day, near 80° with hardly a cloud in the sky. As we paddled upriver, the landscape is hot and dry. Grazing cattle congregate down at the river’s edge where it is cooler and there is plenty of water to drink. Wild animals come down to the river to feed on the only green plants available in the dusty and dry John Day River valley. 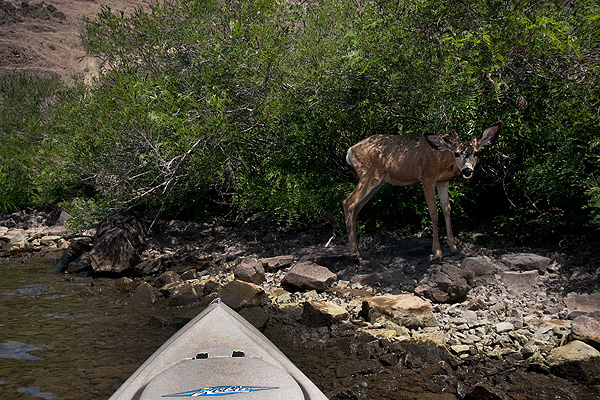 We saw a number of deer, this one let me paddle within six feet or so before running up the river bank. With the wind remaining calm, we paddled back downstream to the John Day rivermouth to finish up our fishing day where we had caught the most fish. I switched from a leadhead grub to a spinnerbait which seemed to be more attractive to the larger bass. I was able to land a number of fish between one and two pounds. While reeling in some of the fish, you could see larger bass approach the hooked fish, perhaps attracted by the activity. The John Day River is known as one of the best smallmouth bass fisheries in the United States. It’s not unusual to catch hundreds of bass in a single day, that was the case today. I easily caught over a hundred bass, I’m not sure exactly how many because I lost count after the first hour or so. Most of them were smaller fish but I did catch maybe twenty or so bigger bass. With all the small bass showing up and the lack of much bigger fish may mean that the smallmouth bass may be spawning, usually those fish won’t bite unless you drag a lure across their spawning nest, or the water temperature has warmed up to the point where the larger bass have already headed for the deeper parts of the river to spend the summer. 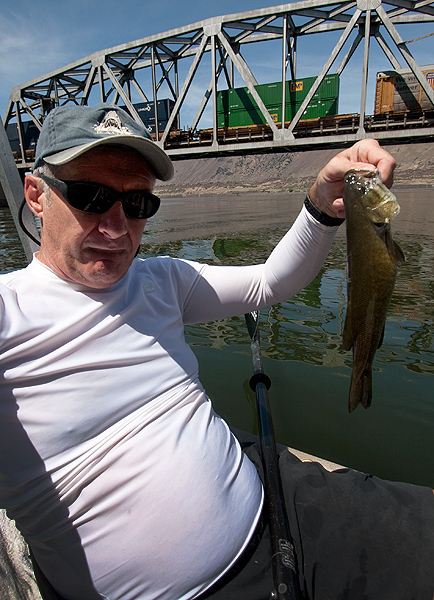 Hopefully, we can get back on the Columbia River soon to see what is going with the smallmouth bass there. The Columbia is a different environment than the John Day; deeper and colder, so the fishing may be a little different. We may try for some spring Chinook salmon, they are harder to catch than the fall Chinooks, but if it’s too windy for smallmouth bass fishing on the main river, we may try some of the smaller rivers that are more wind sheltered for a chance at a spring Chinook.